Cersei's (Lena Headey) machinations continue, old acquaintances are renewed, Jon Snow (Kit Harington) rides a dragon, and the Mother of Dragons arrives in Winterfell. The final season premiere of Game of Thrones also drops last season's bombshell on Jon as Sam (John Bradley) explains the truth about his best friend's lineage. Eventually accepting the truth, it's still unclear how the news changes Jon's plans or his new love (which is all too easy for his sister to see). What is mentioned, but doesn't make it on-screen, is the army of the Night King continuing to move south. 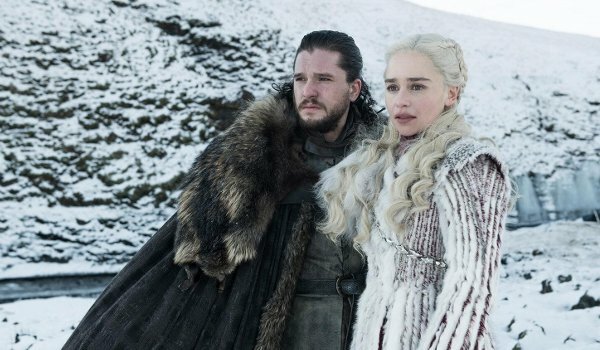 While Daenerys (Emilia Clarke) and Jon manage the entire voyage North, and Circe's army arrives from across the sea, in the time between last season's finale and now, apparently the army of the dead are taking the scenic route south. Although not much plot is advanced, other than Jon learning the secret of his life, the episode has several nice moments, including the reunions between Arya (Maisie Williams) and Jon, that of Sansa (Sophie Turner) and Tyrion (Peter Dinklage), and the bittersweet reunion between Sam and Jorah (Iain Glen) where Sam learns the fate of his family. And the episode ends in one more reunion as Jaime (Nikolaj Coster-Waldau) finally arrives in the north only to find Bran (Isaac Hempstead Wright) waiting for him. Successfully rescuing his sister, Theon (Alfie Allen) proves his worth, while also throwing a crimp in Circe's plans. Theron, like Jon's friends headed south from the wall, head to Winterfell as more plot threads become interwoven with the battle that is to come.